The government’s moves to ban printing in public places, following the revelations that the small particles of toner that are emitted can do damage to the lungs similar to that caused by smoking, has met fierce criticism from civil liberties groups and the National Union of Secretaries. "I have been using laser printers dozens of times a day for nearly 20 years now," said Gregory Billingsworth an accountant at a large city brokerage house. "I need a good printed spreadsheet with my coffee to kick start the morning. As the day goes on there is nothing better to relieve the stress than to print out a nice memo or two." 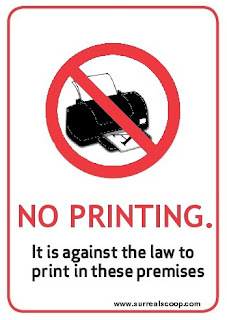 Under the new legislation, which will take effect from the start of next month, it will be illegal to print in all public buildings. Anyone wishing to do so will have to make use of designated outdoor printing areas. Campaign groups such as the People’s Union for Liberty in Printing (PULP) have rallied against the new legislation saying that it could have severe implications for not just the social interaction at the office printer but also for the larger economy in general. "Printer manufacturers will suffer and the ban will do nothing to improve the health of the nation," said a representative of PULP. "People will probably catch their deaths standing in the cold and rain whilst their daily status report is printed." Assertions that the new laws will provide a safer working environment for all concerned and hasten the march to the long awaited ‘paperless office’ have not convinced serial printers. "I have used everything from the original HP Laserjet back in the mid 80s to the latest full colour multifunction devices and I will continue to enjoy printing documents," said Mr Billingsworth. "The law is draconian, making normal citizens spy on each other. Where will it stop? Next someone will say that if I am working late in the office I can’t light up a cigarette after faxing my secretary."